The bogan will tell you that it doesn’t like intellectuals. Intellectuals are poofs because they think they’re better than the bogan, despite the intellectual having no track record in train surfing, Jager Bombing, or quoting from Two and a Half Men. But regardless of its dislike of critical or abstract thought, the bogan has an inexplicable need to see itself as very intelligent. However, having never done anything especially intelligent, the bogan finds itself faced with a deficit of proof in this regard. So the bogan embarks on a search for evidence of its own intelligence; a process that intrinsically involves a thorough disregard for the amply available evidence that it is not intelligent at all. But after a while, the bogan realises that beating five year old Mavrik at basic maths problems on its Nintendo DS will not be sufficient. After an aborted attempt at trying to unwrap its newly acquired Rubik’s cube, the bogan turns to online IQ tests. IQ tests have been popular for over 80 years as a pleasing way to quantify a narrow measure of mental potential, and the idea of a simple test to substitute for tangible life achievement is immensely appealing to the bogan, who just hasn’t got around to starting its own online business empire or solving cold fusion yet. Typically, IQ tests are conducted by accredited psychologists to ensure some degree of credibility, but due to most psychologists being somewhat intellectual, this environment is unacceptable for the score-hungry bogan. The other problem with clinical IQ tests is the difficulty of posting the outcome to a Facebook page for the purpose of boasting and adulation. Fortunately, the bogan is aware of the capacity to score 137 on a highly legit online IQ test, cheerfully completed in only 5 minutes. The bogan is initially puzzled at the term “percentile” in the accompanying “Your IQ score is…” e-mail, but is relieved to read the word ‘genius’ next to this obvious typo. Some seconds later, its status update reads “OMG. OMG! 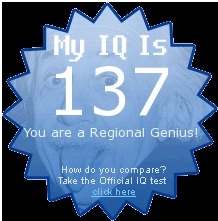 Just totally did one of them IQ test and I’m like a totally genius. ROLF”. A few more seconds later, the bogan is pleased to find that 18 co-bogans have pressed ‘like’ on this. IQ tests form a convenient, highly quotable measure of a bogan’s alleged intelligence. However, should it perform unsatisfactorily and its score be regarded as intellectually retarded, it will rapidly disregard the test as stupid. IQ tests, the bogan will tell itself, don’t measure character, charm, wit or the all-important knowledge in the ‘Real World’. The National IQ Test, conducted once in 8 years and hosted by MENSA president Eddie McGuire and Livanilla Nixon is thus a formidable day of reckoning for the bogan. On this day, it pits its mad mental skills against the rest of the country, but mainly against WAGs, tradies, Boost juice franchisees, Elvis impersonators and sports fanatics. With the help of a little bit of corner cutting, collusion, and amending, the bogan’s eventual score will possibly be enough for it to sink smugly back into its wallow of Zoo Weekly, fad diets, and red carpet specials.